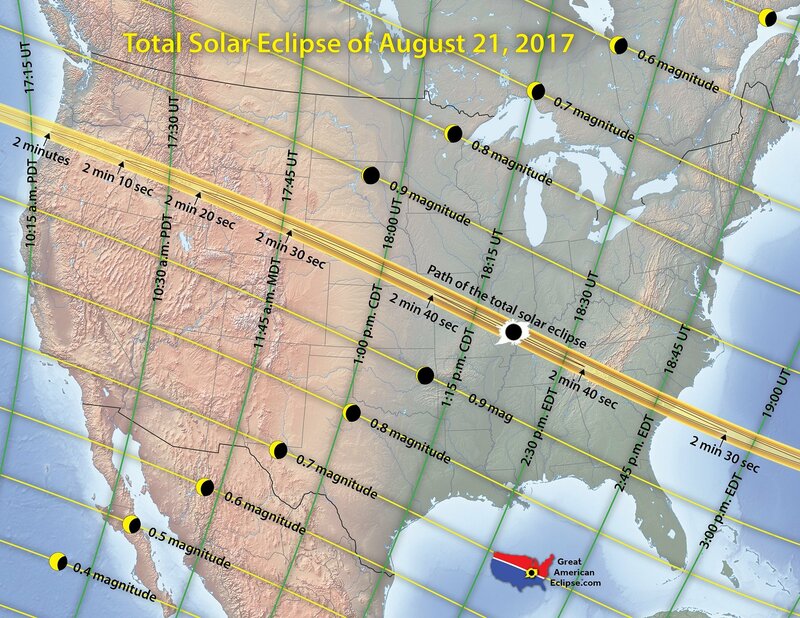 On August 21, 2017, a Total Solar Eclipse will occur along a track running across the Continental USA from Salem, Oregon to Charleston, South Carolina. On August 21, 2017, people across the United States will see the sun disappear behind the moon, turning daylight into twilight, causing the temperature drop rapidly and revealing massive streamers of light streaking through the sky around the silhouette of the moon. On that day, America will fall under the path of a total solar eclipse. Here is our complete guide to the 2017 total solar eclipse. It includes information about where and when to see it, how long it lasts, what you can expect to see, and how to plan ahead to ensure you get the most out of this incredible experience. The total solar eclipse of 2017's path of totality, stretching from Oregon to South Carolina. Looking directly at the sun, even when it is partially covered by the moon, can cause serious eye damage or blindness. NEVER look at a partial solar eclipse without proper eye protection. See our complete guide to find out how to view the eclipse safely. 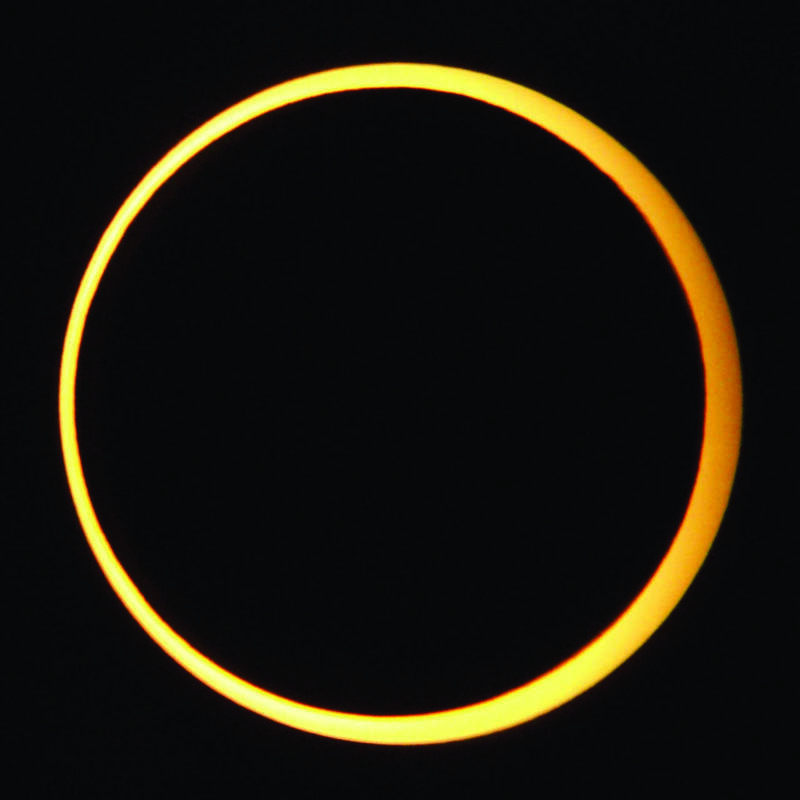 A total solar eclipse occurs when the disk of the moon appears to completely cover the disk of the sun in the sky. The fact that total solar eclipses occur at all is a quirk of cosmic geometry. The moon orbits an average of 239,000 miles (385,000 kilometers) from Earth – just the right distance to seem the same size in the sky as the much-larger sun. However, these heavenly bodies line up only about once every 18 months. 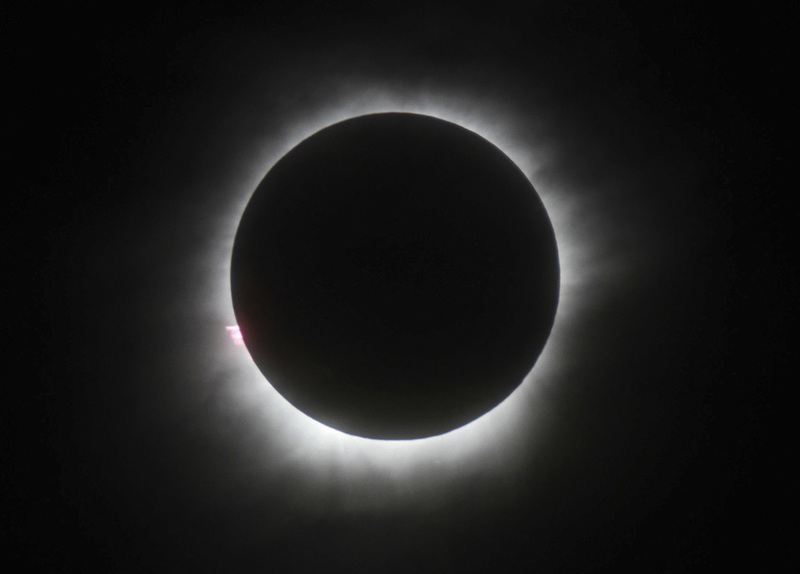 Outside the path of totality, skywatchers in the continental U.S. and other nearby areas will see a partial solar eclipse, in which the moon appears to take a bite out of the sun's disk. Two to five solar eclipses occur each year on average, but total solar eclipses happen just once every 18 months or so. When the moon covers up the sun, skywatchers delight in the opportunity to see a rare spectacle. 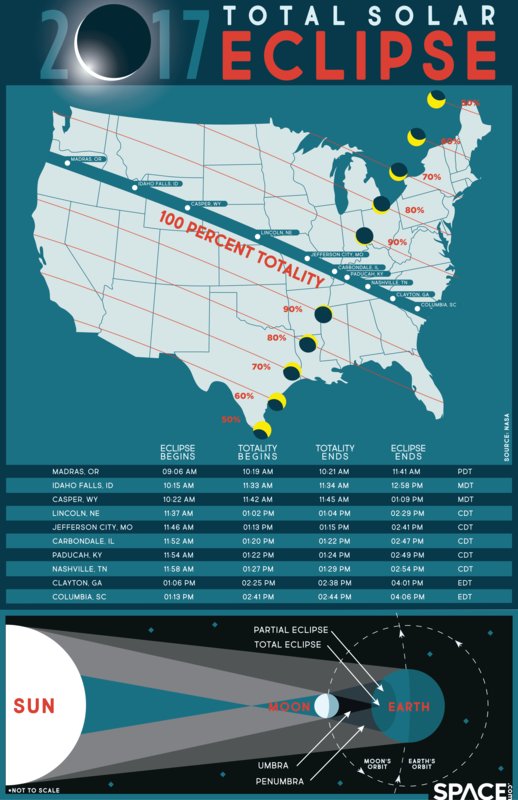 See how solar eclipses occur in this Space.com infographic. 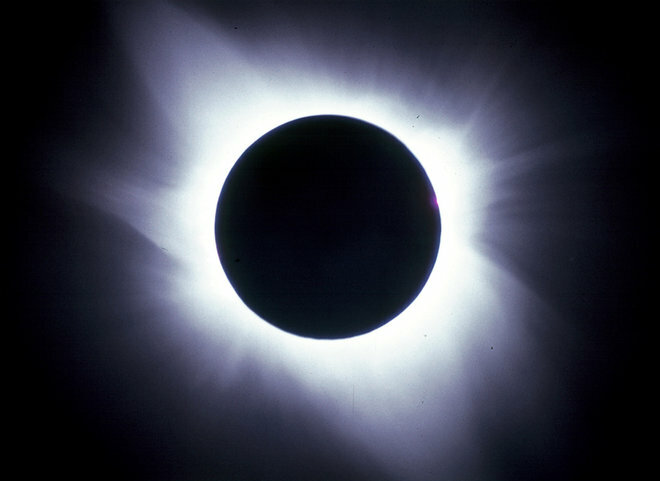 During a total solar eclipse, the disk of the moon blocks out the last sliver of light from the sun, and the sun's outer atmosphere, the corona, becomes visible. The corona is far from an indistinct haze; skywatchers report seeing great jets and ribbons of light, twisting and curling out into the sky. During totality, the area inside the moon's shadow is cloaked in twilight – a very strange feeling to experience in the middle of the day. Just before and just after totality, observers can see this cloak of darkness moving toward them across the landscape, and then moving away. One unique phenomenon that occurs at the beginning and end of a total solar eclipse is known as Baily's beads. Baily's beads refers to small slivers of sunlight, or beads, that are still visible around the Moon during a total solar eclipse. These “beads” are the result of light filtering through the irregular surface of the Moon as a result of topographical features like mountains, craters, and valleys. Another unique view, known as the diamond ring effect, is seen when only one bead is visible. Baily's beads are named in honor of Francis Baily (1774 – 1844) who provided an explanation for these small slivers of light in 1836. 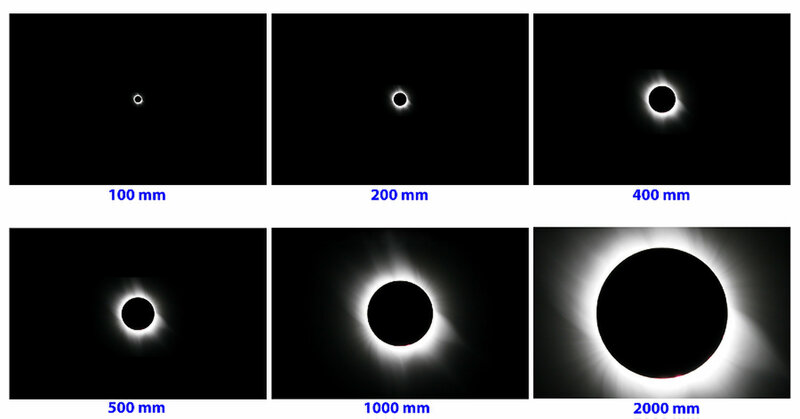 A view of Bailey's beads and a montage of the actual total solar eclipse over Indonesia including two examples of the diamond ring effect (images 3 and 5). During totality, the naked eye star Regulus, in Leo the Lion, will be sitting less than one degree (about a finger's width) to the upper left of the eclipsed Sun. Reddish Mars, though slightly dimmer at magnitude 1.77, will be 8 degrees (just under a fist diameter) to the right of the eclipse. Looking farther along the same line, very bright Venus will be located 34 degrees to the lower right (west) of the eclipse. Look 51 degrees in the opposite direction for bright Jupiter. For a challenge, you can hunt for Mercury, at visual magnitude 4.2, sitting only 10 degrees to the left of the eclipse. The path of totality for the August 21, 2017, total solar eclipse is about 70 miles wide and stretches from Oregon to South Carolina. It passes through Idaho, Wyoming, Nebraska, Kansas, Missouri, Illinois, Kentucky, Tennessee, Georgia, North Carolina and South Carolina. You can use the interactive eclipse map in Eclipse Safari to zoom in on the path of totality and find out the exact locations from which it will be visible. You may also want to attend one of the many eclipse parties and organized events taking place around the path of totality. At most, the moon will completely cover the disk of the sun for 2 minutes and 40 seconds. That's about how long totality will last for observers positioned anywhere along the center of the path of totality. As you move toward the edge of the path, the duration of totality will decrease. People standing at the very edge of the path may observe totality for only a few seconds. Because the shadow of the moon will move from west to east, totality will occur later in the day the farther east you travel. Use Eclipse Safari to find out exactly when totality will occur and how long it will last in the location where you plan to observe the eclipse. Just click on a spot on the map, and specific times will be listed in the event time table. NEVER LOOK DIRECTLY AT THE SUN. Permanent eye damage can result. Instead, proper telescope filters or protective glasses from reputable astronomy dealers should be used. Check our Eclipse Store for solar products that feature Solar Safe filter technology providing the ultimate protection from harmful solar radiation, including both IR and UV light. Anyone planning to view the total solar eclipse of 2017 should get a pair of solar viewing glasses. These protective shades make it possible for observers to look directly at the sun before and after totality. 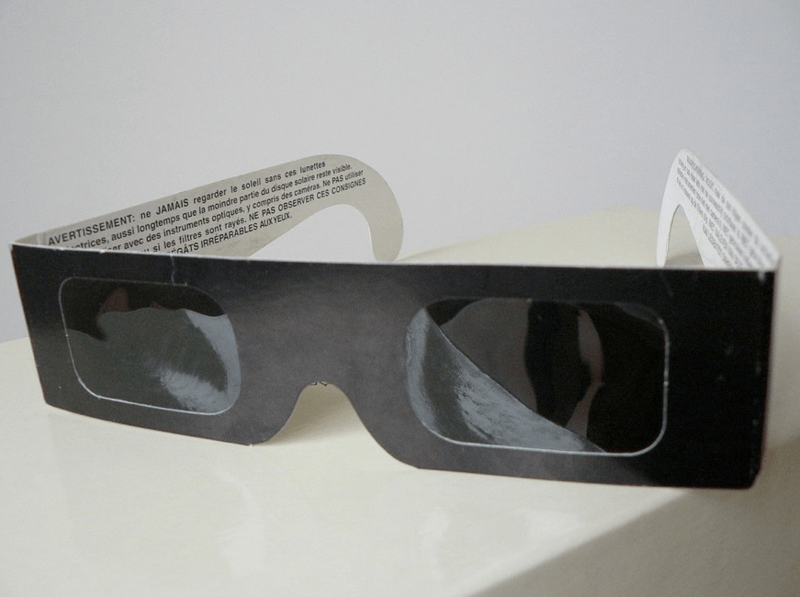 The following five companies sell eclipse glasses that meet the international standard (ISO 12312-2) recommended by NASA, the AAS and other scientific organizations: Celestron, Rainbow Symphony, American Paper Optics, Thousand Oaks Optical and TSE 17. Eclipse shades are a safe and inexpensive way to view the Sun. For serious eclipse observing, a telescope with a full-aperture solar filter is best. Such filters are attached on the end of the telescope that is facing the Sun, not the side facing your eye. 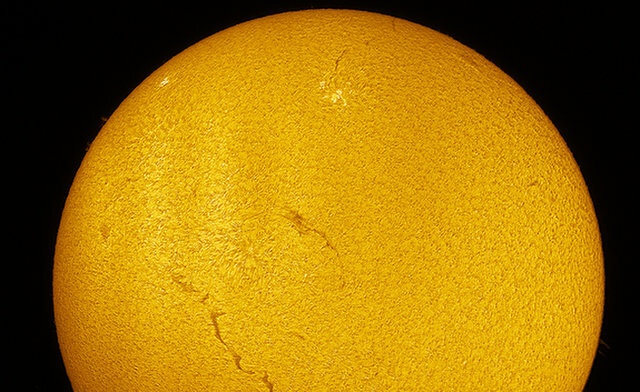 This will cause most of the sunlight to be filtered out before entering your telescope. The eclipse should be watched only with an appropriate solar filter. If your telescope comes with a filter that screws into the eyepiece, discard it immediately! Such filters have been known to crack under the intense heat of the Sun's magnified image. Lastly, never look at the Sun directly through your smaller, finder scope as it will cause permanent eye damage. It is strongly advised to cover the finder scope before the event so as to avoid looking through it accidentally. 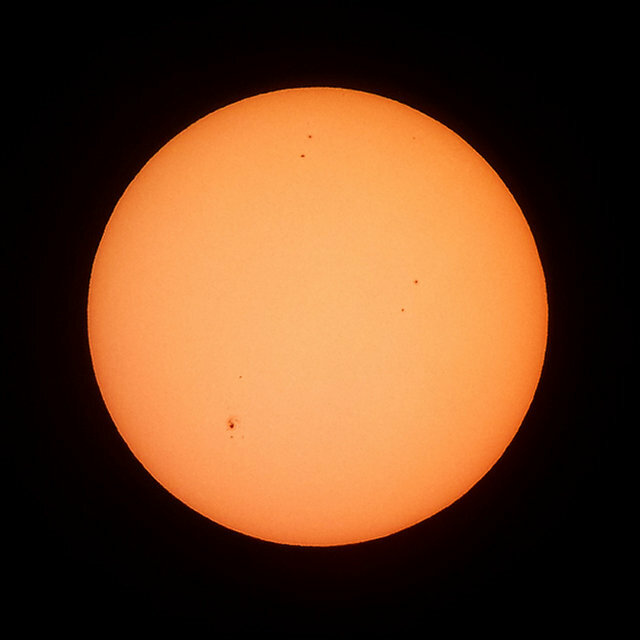 Safe solar filters are available in many different sizes suitable for any telescope. They fit snugly over the front of the telescope and reflect away 99.99% of the Sun's light and heat, allowing a safe 0.01% through. The Sun appears as a white circle set in a perfectly black sky, because no sky light is able to penetrate the filter. 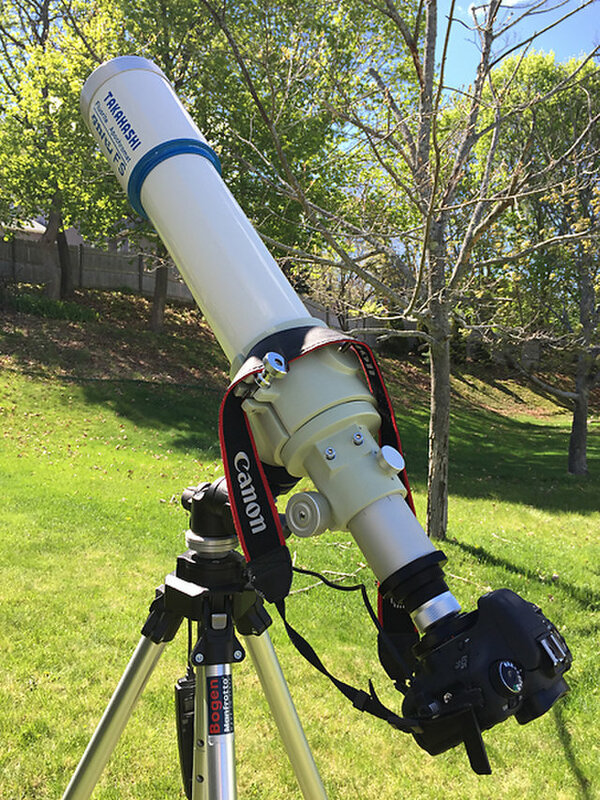 A telescope fitted with a safe full-aperture solar filter will provide safe views of eclipses, transits, and sunspots. Viewing the Sun directly, particularly during the solar eclipse, is dangerous without a proper solar filter. A safer way to view an eclipse, that requires no expenditure and minimal preparation, is to use a pinhole camera. A safer way to view an eclipse is to use a pinhole camera to project the eclipse image. Make a tiny hole (1-3 mm) in a sheet of paper and hold it up, blocking the Sun. 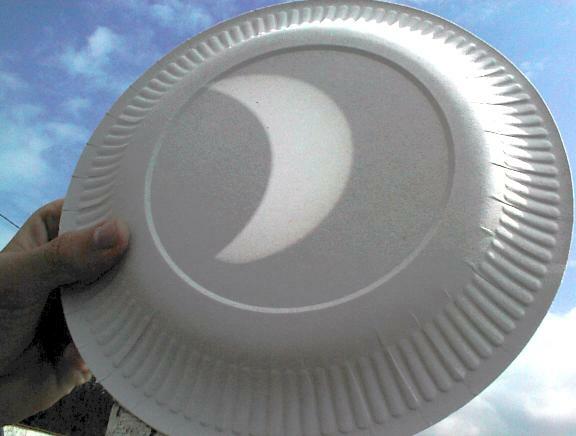 Hold another sheet of paper (or a paper plate) in front of the pinhole, allowing the Sun's light to pass through the pinhole and onto the paper. This will allow you to view an inverted image of the Sun. If you prefer to be indoors, place a large sheet of cardboard in a west-facing window. Make a small hole (about 5mm or 1/4 inch) in the middle of the cardboard. This will act as the lens. Project the image of the Sun on another piece of cardboard at least 3 meters (10 feet) away. This will provide a large enough image so that the Moon will be easily visible. This also has the advantage that a large number of people can view the image simultaneously. It gets people indoors to observe, and lessens the risk of quick peeks at the Sun with unprotected eyes. Unacceptable filters to view the Sun include sunglasses, color film negatives, black-and-white film that contains no silver, photographic neutral density filters, and polarizing filters. Although these materials have very low visible-light transmittance levels, they transmit an unacceptably high level of near-infrared radiation that can cause a thermal retinal burn. The fact that the Sun appears dim, or that you feel no discomfort when looking at the Sun through the filter, is no guarantee that your eyes are safe. 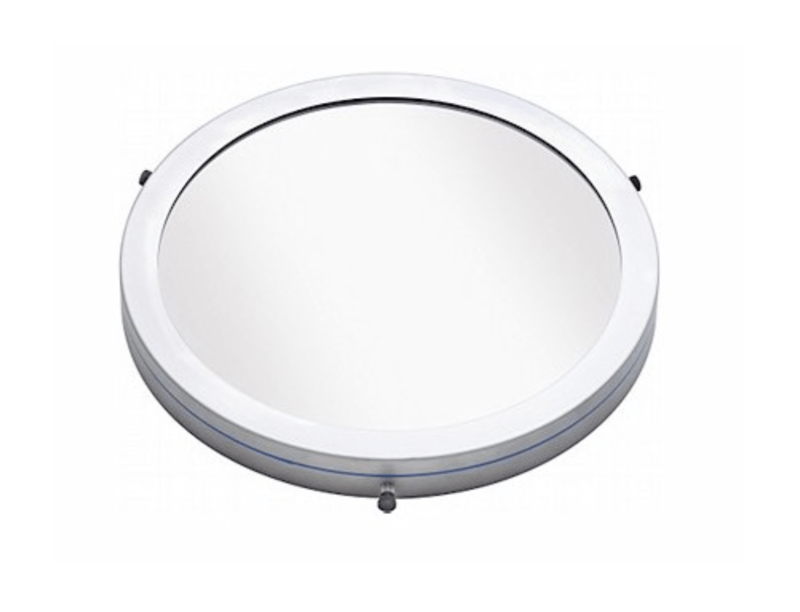 Another good option for schools and large groups is the Sunspotter. This is a wooden, folded-path, Keplerian telescope that provides a safe and convenient way to view the brilliant light of the Sun. By using a series of mirrors, the device projects a bright 3.25-inch solar image onto a 5-inch white viewing screen. 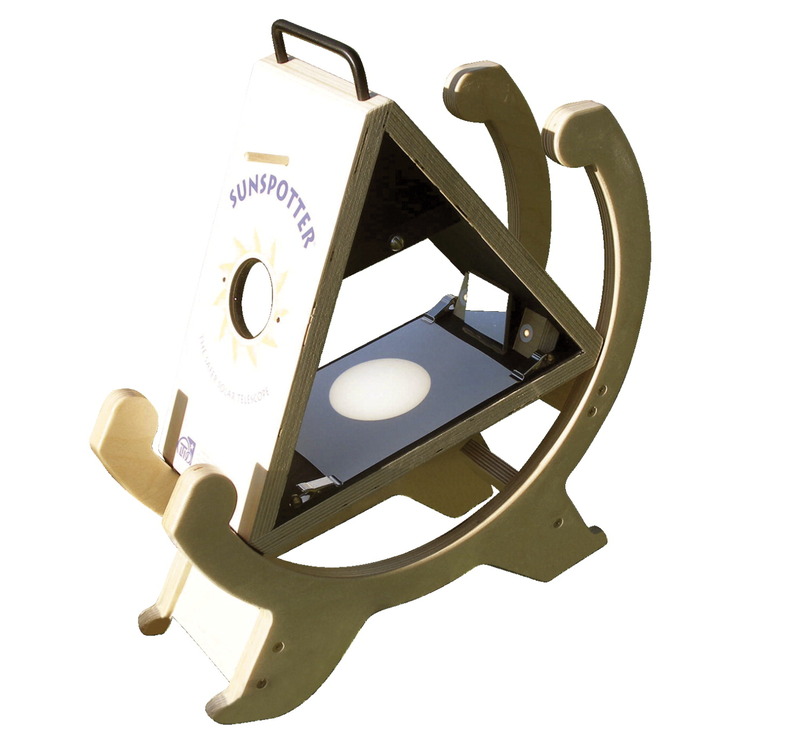 You can use the Sunspotter for viewing the Sun, eclipses, transits, and for daily record keeping. A Sunspotter allows several observers to safely view the Sun's disk. The transit will occur around mid-day over most of North America, when the Sun is high in the sky, so that many people will notice that something is happening on the Sun and then will be tempted to look at it without adequate protection. The risk of permanent eye damage to the general public is extremely high, unless amateur astronomers take an active role in publicizing the danger, and providing safe alternatives. Amateur astronomers like yourself are aware of the dangers, and will take adequate precautions with solar filters. The general public will not, and are at great risk. It is our responsibility to educate people of the dangers, and provide alternative safe viewing situations. Finally, take the opportunity to do “sidewalk astronomy” by setting up telescopes with proper filtration for viewing by the general public at schools, libraries, and outdoor shopping malls. This will encourage the public to practice safe viewing, especially if you can hand out free eclipse glasses. Shadows become quite interesting. 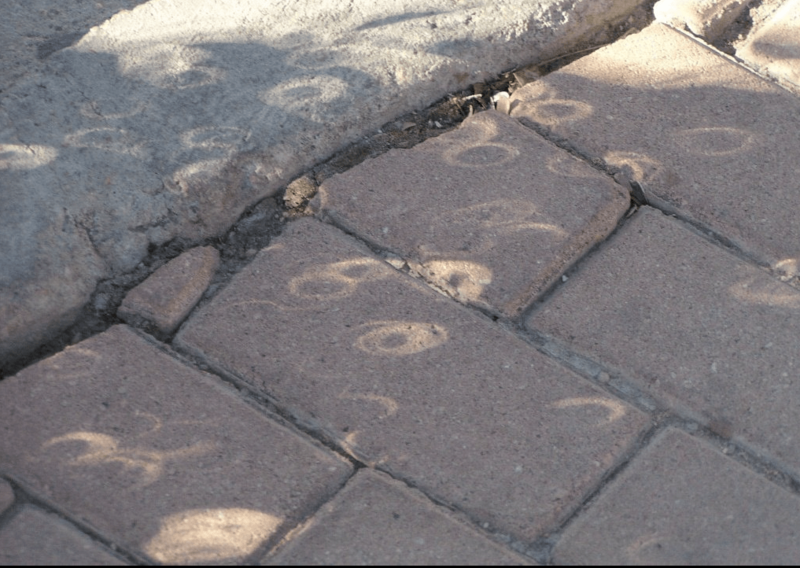 As the sunlight is filtered through leaves, you can enjoy tiny eclipse images sparkling on the ground. Each tiny hole formed from the spaces between the leaves allows a projection of the eclipse image to shine through onto the ground, much like a "pinhole projector." Nature provides many natural pinholes: you will see miniature solar images everywhere. 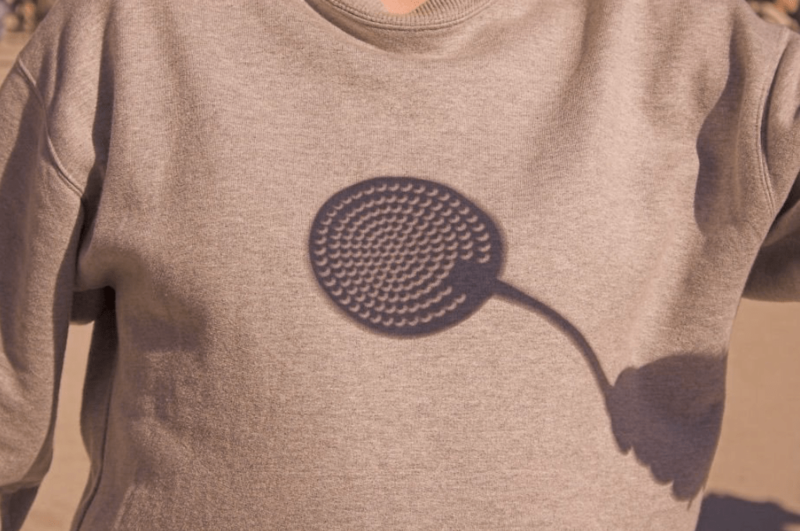 You can also use an object like a kitchen skimmer (or anything with small holes) and project the tiny eclipse images on a surface such as your t-shirt! If you don't have a kitchen skimmer, hold your fingers, crossed together, over your head. The shadows produced by the tiny spaces in between your fingers will produce miniature eclipse images. 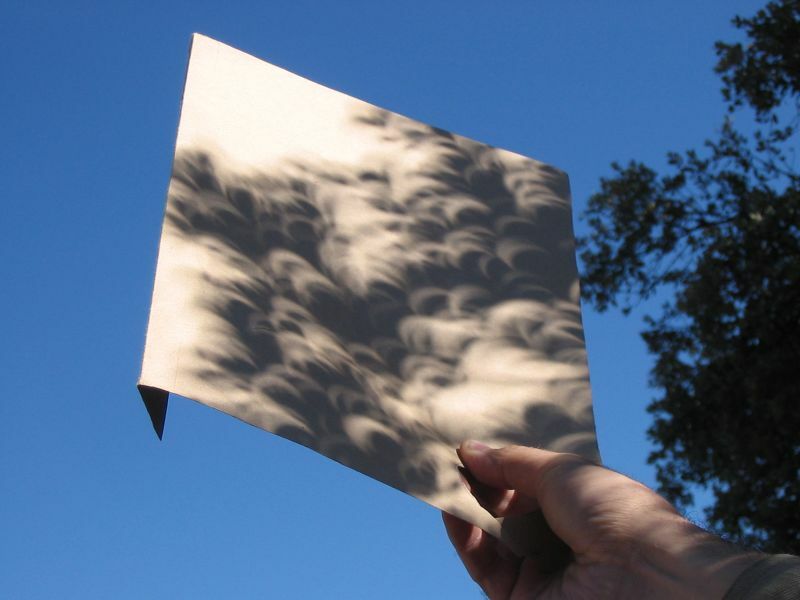 In the 2005 annular eclipse, Steve G.S., captured little annular eclipse images projected through gaps between the leaves of a tree, which formed pinhole cameras. Credit: Steve G.S., from the 2005 annular eclipse in Spain. Holes in the leaf canopy produce a pinhole effect that project images of the eclipse on a sheet of paper. On July 22, 2010, a partial solar eclipse was enjoyed by the inhabitants of Hong Kong as images of the partially eclipsed Sun adorned the city itself. 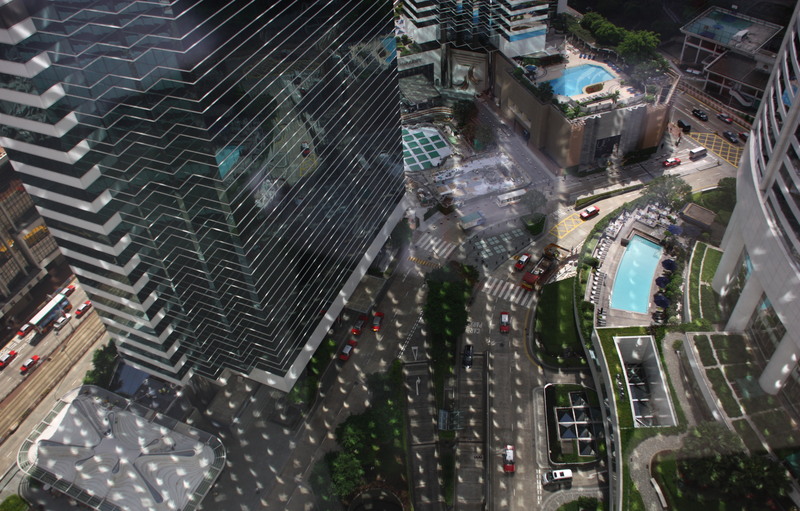 In this down looking photo, taken at 9:40am local time, a remarkable array of solar eclipse views was created by reflection in a grid of eastward facing skyscraper windows. The photographer's location was the 27th floor of Two Pacific Place. August 21, 2017, may be one of the worst traffic days in national history, some NASA representatives predict. Although about 12 million people live within the narrow band of totality, approximately 25 million reside within a day's drive of it, and the agency has estimated that the population inside the path of totality may double on the day of the eclipse. During totality, the sun's outer atmosphere, called the corona, blazes forth in all its glory. This view of the corona was captured by eclipse photographers Imelda Joson and Edwin Aguirre on July 11, 1991, along the eclipse track's central line in Baja California Sur, Mexico. Here are some pointers to help you increase your chances of success in capturing souvenir images of the greatest celestial show of the decade. Never look directly at the sun without eye protection, such as solar-viewing glasses or a solar filter for your camera, binoculars or telescope. Failure to do so can result in serious eye injury or permanent blindness. A No. 14 arc-welder's glass filter is also acceptable, but ordinary sunglasses and polarizing or neutral-density filters used in regular photography are not safe and should not be used. If you don't want to deal with polar alignment and telescope counterweights, a better alternative would be to use a computerized GoTo altazimuth mount, such as iOptron's AZ Mount Pro. This compact, portable and lightweight mount has built-in sensors and GPS for easy setup in the field. All you have to do is level the battery-operated unit on its tripod and turn on the power; after a quick initial calibration, the mount will be ready to go. On August 2, 1133 CE a total solar eclipse occurred in England. A contemporary account stated that “the day darkened over all lands; and the Sun became as it were a three-night-old Moon, and the stars about it at mid-day. Men were greatly wonder-stricken and were affrighted, and said that a great thing should come thereafter.” King Henry I of England (1068 – 1135), the son of William the Conqueror, did die after the eclipse, although his death occurred four years later in 1135 CE as a result of food poisoning from eating too many lampreys (i.e. eels). 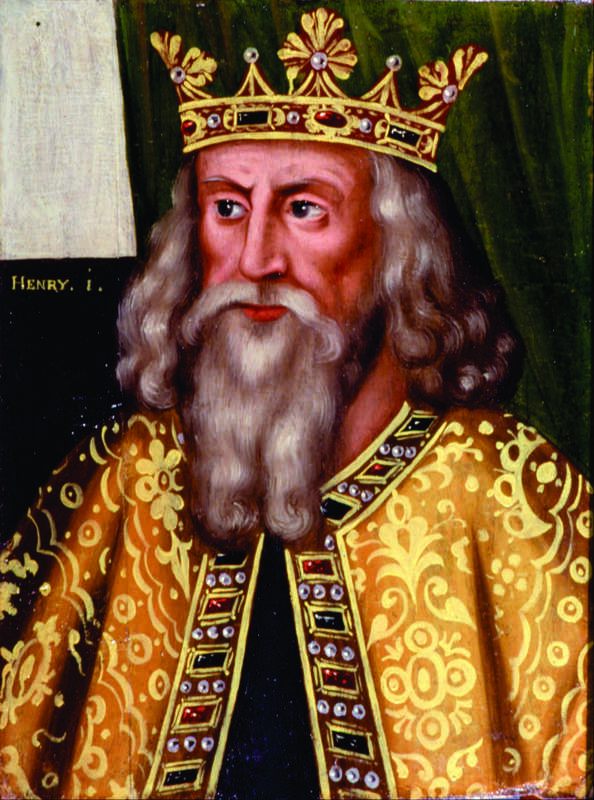 Despite the four year interval between the eclipse and Henry's death, the passing of King Henry I was widely believed to have been foretold by the eclipse and only served to reinforce the then common belief that eclipses were bad omens for monarchs. 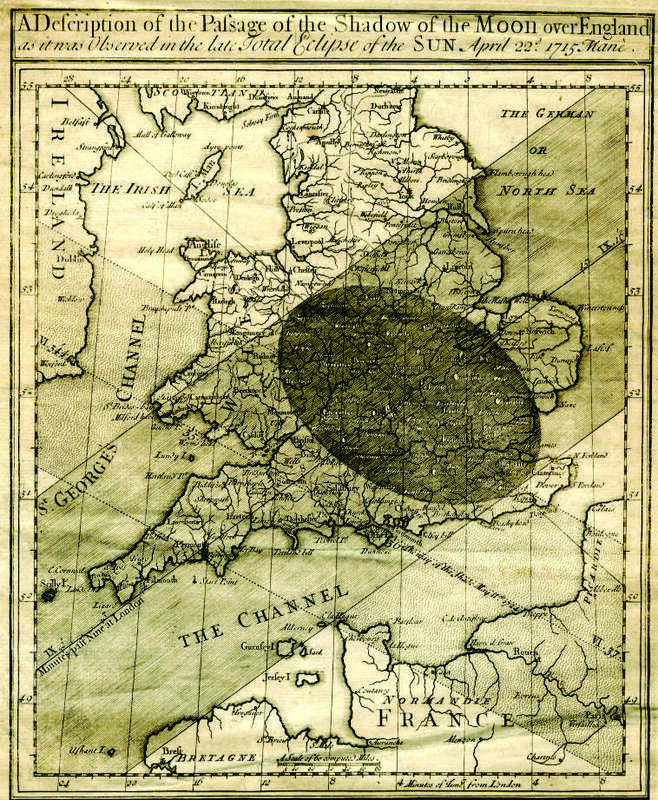 The total solar eclipse of 1715 CE is historically significant because English astronomer and physicist Edmund Halley (1656 – 1742) produced the first map for an eclipse event that showed the predicted path of the umbra on the ground. A careful examination of Halley's map shows that the eclipse is dated to occur on April 22, 1715. This, however, is the old Julian calendar date; England only adopted the “new” Gregorian calendar in 1752. The proper date for Halley's eclipse using the modern calendar is thus actually May 3, 1715. 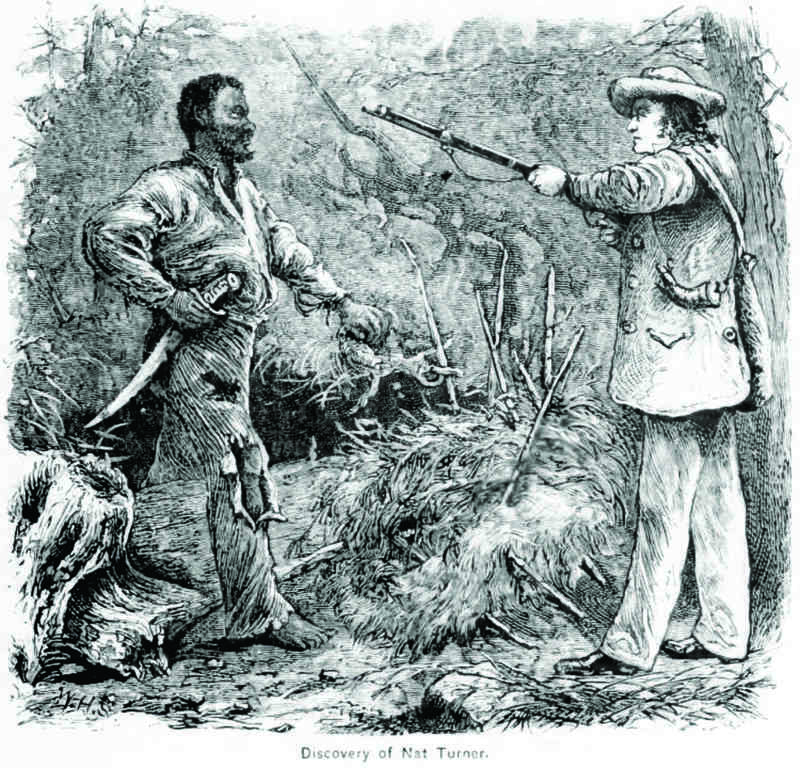 Nat Turner (1800 – 1831) was an African American slave who led a slave revolt in Virginia in 1831. Turner believed that he could hear divine voices and see prophetic visions. He stated that “I had a vision ... I saw white and black spirits engaged in battle, and the sun was darkened.” A solar eclipse occurred on February 12, 1831 CE which Turner interpreted as a message from God urging him to begin planning for a slave insurrection; Turner eventually began his slave revolt on August 21. Although the revolt was quelled after two days, Turner himself evaded capture for an additional two months before eventually being caught. Turner was hanged on November 11. The recent 2016 film The Birth of a Nation recounted the story of Nat Turner's slave revolt. The total solar eclipse of May 29, 1919 CE is important in Science history because it provided the first experimental test of Albert Einstein's general theory of relativity. Einstein's theory had predicted that the very fabric of space would be warped by the presence of large massive bodies like the Sun. This warping would cause light to travel in a curved path near a massive body instead of in a straight line. This prediction was test by Sir Arthur Eddington (1882 – 1944), an English physicist, during the May 29 total solar eclipse. Eddington observed in an expedition to the island of Principe off the coast of West Africa that light from the Hyades star cluster was indeed warped by the eclipsed Sun in complete accord with Einstein's theory. One of Eddington's actual plates of the 1919 eclipse that helped to confirm Einstein's theory of general relativity.